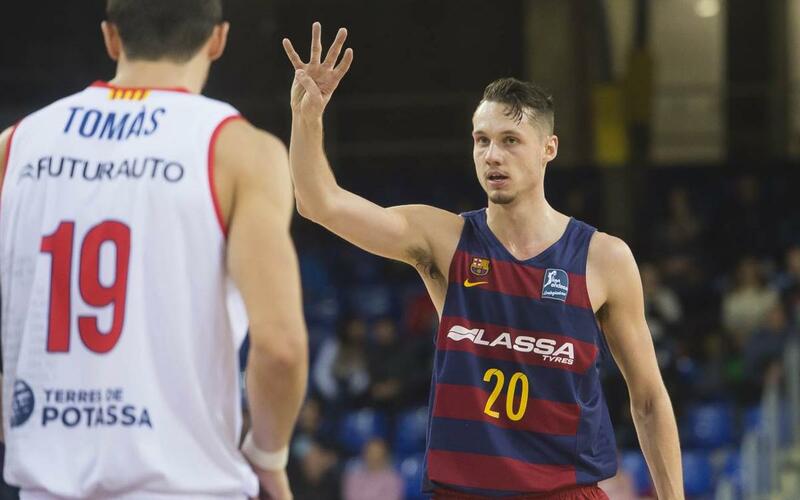 Barça Lassa secured an impressive victory in the Catalan derby following a high-class performance in the 21st fixture of the Endesa League season. The blaugranas passed their latest test ahead of the Copa del Rey quarter finals. Bartzokas used the bench to help his team cope with the enforced absences of Oleson, Renfroe, Lawal, Ribas and Doellman. One of those who was available was Navarro who played his 650th game in the ACB, which made him the sixth man to reach this incredible record. The other positive was Xavier Munford’s debut in the Endesa League. Barça were aware of the importance of this fixture and they started with intent. The blaugranas’ attack was firing on all cylinders with 33 points scored in the first quarter. Rice and Tomic linked well and Eriksson scored freely during the opening ten minutes. However, the away side stayed in touch with some good attacking play of their own. The second quarter maintained the same dynamic with Eriksson shining brightest in attack with two three pointers in a row in the 13th minute and he helped build an impressive lead (43-28). The Swede was the best player on the court by far with five three pointers helping him reach a points tally of 21. The intensity in defence improved from the 15th minute onwards and the away side saw their attack stifled with the blaugranas limiting Manresa to six points in the final five minutes of the second quarter (55-41). After the break, the blaugranas stuck to their game plan and Rice set up Diagné for a smash. The North American built from the back impeccably by linking with Tomic frequently and choosing the right option almost every time. Halfway through the third quarter the opposition coach, Ibón Navarro, asked for a time out in order to try and change the momentum of the game. The team from Manresa didn’t lose faith and came to within eight points but Faverani opened the gap once more to make it 73-61 in the 29th minute. The final quarter was all Barça Lassa who attacked for long periods and moved the ball around well. In the end, the 20 point difference was just reward for the blaugranas’ dominance (92-72). The win helped extend Barça's fantastic record of 36 victories in as many game against Manresa at the Palau. Bartzokas and his players will now turn their attention to the quarter finals of the Copa del Rey next Friday 17 February against Unicaja Málaga.